What is Theme Editor in WordPress? 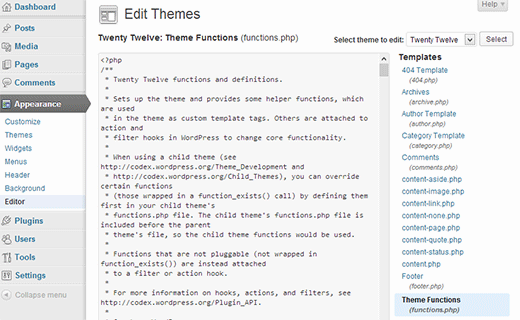 Theme editor is a simple text editor in WordPress located at Appearance » Editor. It allows you to modify WordPress theme files from the admin area. You can see the preview of the theme editor in the screenshot below. On the right hand of the editor, there is the list of editable files in the currently active theme. Above the list of template files, there is a drop down menu which allows users to switch among themes even the inactive themes. Often users get confused by this functionality because they think that selecting another theme will activate that theme. It does NOT. If you select another to edit the code, it only opens the theme files in the editor. It DOES NOT activate the theme. You have to activate the theme by going to Appearance » Themes. It is important to note that if you don’t know how to code, then you should NOT be using the theme editor. Often users use the theme editor to edit the functions.php file to paste a snippet from the web. When pasted incorrectly, they get locked out of their own site. We strongly recommend that you familiarize yourself of FTP before editing functions.php file through the theme editor. Secondly, we recommend that you read our beginner’s guide on how to paste code from web articles to avoid syntax errors. If you are a developer and you don’t want your clients or users to break the site, then we highly recommend that you disable the theme and plugin editor from the WordPress admin.